Calamophis ruuddelangi Murphy, 2012: 520. Holotype: MNHN 5175. Type locality: Ambuak, West Papua, Indonesia. Brachyorrhos jobiensis – Peters and Doria, 1878: 371. Distribution: Known only from the type locality and Kebar Valley, West Papua (BPBM 3850), Indonesia (Murphy 2012). Diagnosis: A fangless homalopsid. 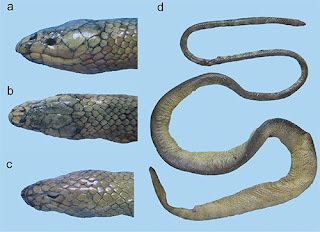 Gracile cylindrical body, relatively short tail (12% of SVL); six upper labials, fifth tallest, three and four shorter, ventrals 143–145, subcaudals 21–23.